DoCoMo today announced the development of new 3G FOMA handsets – the 703i-series plus the D800iDS and SO903iTV. The 703i-series consists of eight models: N703i, P703i, D703i, F703i, N703iD, P703i, SH703i and SO703i. Most of the models are extra slim, with the N703i (image at right) and P703i being the thinnest 3G clamshell handsets in the world, at 11.4mm each, as of 15 January 2007 (and according to the company). The new 703i-series handsets made by NEC, Panasonic, Mitsubishi, Sharp, Fujitsu and Sony Ericsson have features ranging from full-track music, Mega Appli gaming and DCMX mobile commerce to document viewer and full mobile web browser. 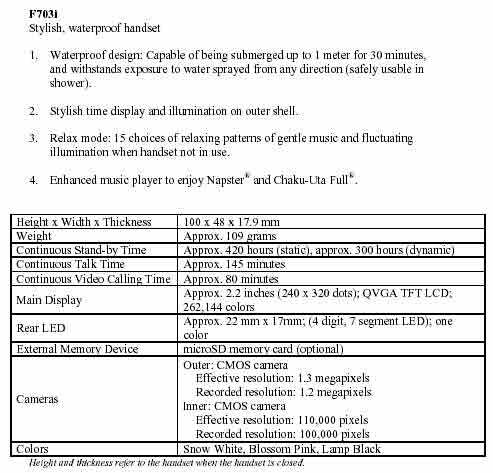 A couple of interesting design notes; Fujitsu’s F703i model is water-proof and claims to be completely safe in the shower while Mitsubishi’s D703i is Japan’s thinnest candybar-style cellphone available, at 9.9mm thick. DoCoMo also unveiled the SO903iTV handset equipped with a high-resolution LCD using BRAVIA technology and high-quality audio for viewing “One-segment” (1 Seg) terrestrial digital TV broadcasts. In addition the company announced the D800iDS [.jpg image], which according to the press materials, is a world-first cellphone with two full screens – a conventional upper screen and a touch-screen instead of the traditional lower keypad. 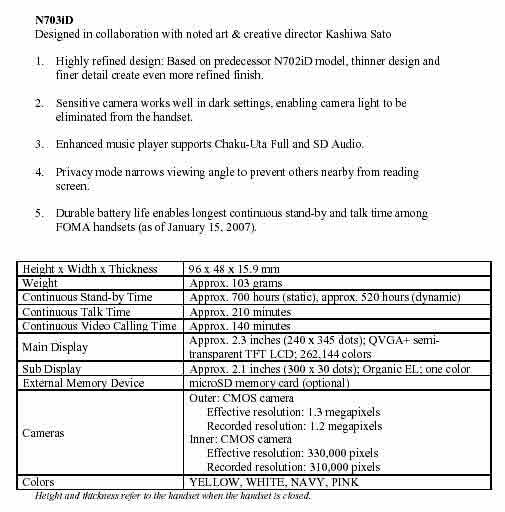 The N703iD will be marketed on 26 January. The other 703i-series models and D800iDS are planned to be sold in February, while the SO903iTV is scheduled to be launched in June. We have images with full details prepared for WWJ subscribers after the jump. 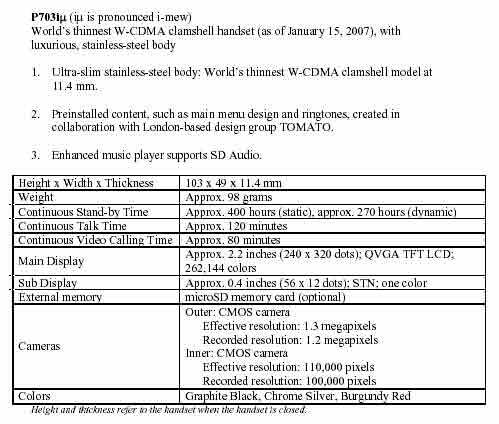 The P703iµ by Panasonic (shares the title with NEC below) as the worlds thinnest 3G clamshell handset, at 11.4mm, as of January 15th 2007. It has pre-installed content, such as main menu design and ringtones, created in collaboration with London-based design group TOMATO. 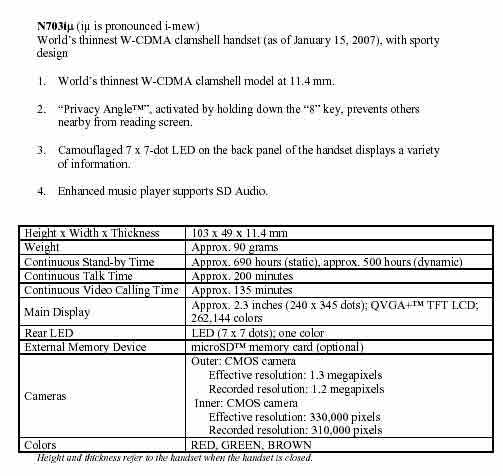 NEC’s N703iµ (iµ is pronnounced i-mew) also at a svelt 11.4mm thick has a music player and can download full track songs. 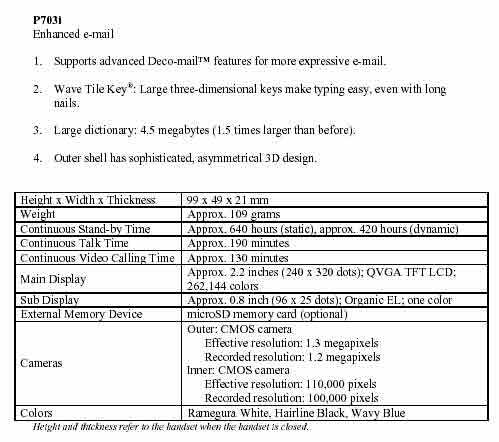 It comes capable to handle 2MB e-mail attachements and has Omakase lock along with enhanced i-Channel and Chaku-moji features. The F703i by Fujitsu is water-proof: capable of being submerged up to 1 meter for 30 minutes and the design claims to be safty useable in the shower. 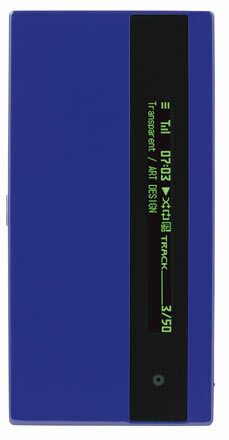 It has windows media player to allow full track downloads via Napster and comes with DCMX m-commerce pre-installed. SH703i by Sharp has a polish half metallic body with 2.4-inch ASV screen and 2-megapixel camera. 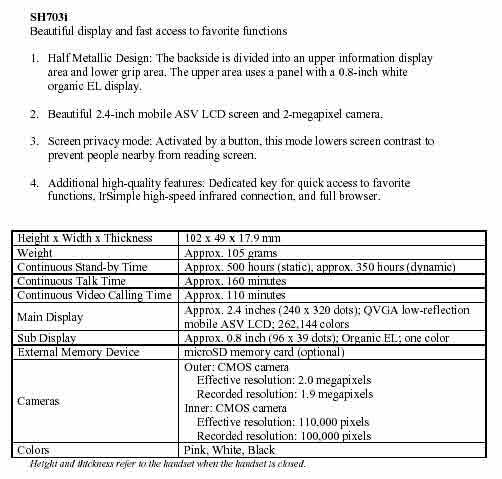 It includes a button activated privacy screen mode which lowers the screen contrast to prevent people nearby from viewing the contents. This unit also comes with a music player, a full web browser and is m-commerce enabled. 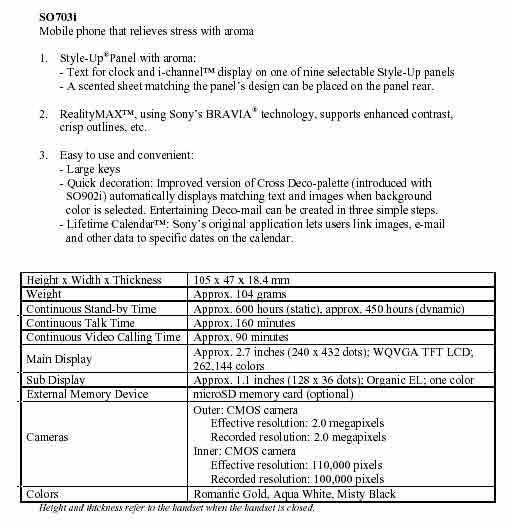 Sony Ericssons SO703i comes with their trademark exchangable Style-Up exterior panel system and this round includes the option of adding a ‘scented sheet’ matching the panel design. The display runs Bravia’s RealityMax technology and the model comes fully loaded with functions to enable full track music, Mega Games, mobile commerce and enhanced push-to-talk. 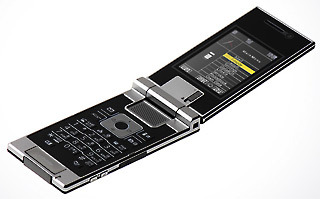 Mitsubishi’s D703i is Japans thinnest non-folding (candy bar style) handset at just 9.9mm thick. It can download full music tracks and play the new Mega-Appli games but does not have DCMX (m-commerce) pre-installed. The unit also touts a full browser, document viewer and 27 ‘diverse illumination choices’ for the keypad. 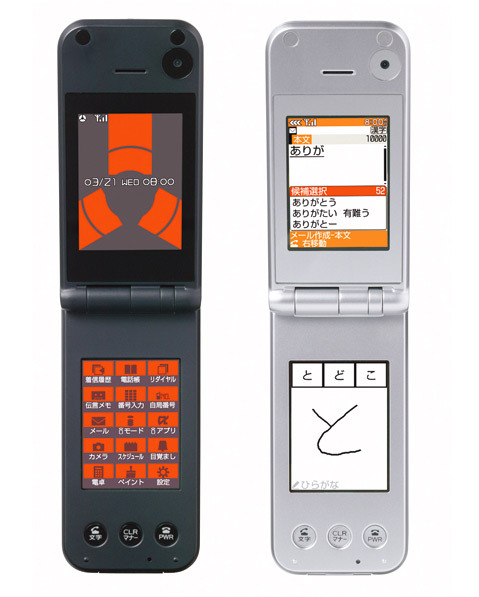 The N703iD was designed in collaboration with Kashiwa Sato and is a refined version of the predecessor 702iD model. Apparently the camera performs better in low-light settings and it claims enhanced battery power – the longest of all FOMA 3G handsets – of 700 minutes stand-by and 210 minutes of continuous talk time. This model comes loaded with music player, Mega Appli games, m-commerce and push-to-talk functions. 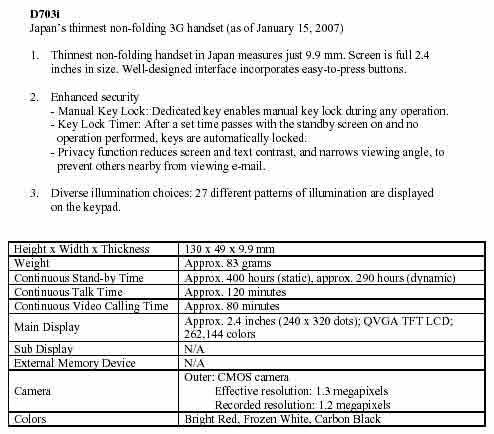 Panasonics P730i comes pre-loaded with a 4,5MB dictionary and introduces a so-called Wave Tile keyboard design to make enable faster and easier text imput. It does not have a full web browser or document viewer but otherwise supports almost all services announced with the 703i-series. DoCoMo announced the first ever 800 model, listed on their website as a concept design The D800iDS by Mitsubishi has a dual display with a touch screen replacing the conventional lower keyboard. Users have three way to text including hand or stylus written, 2-touch linked with sub-menus and so-called 5-touch standard input. 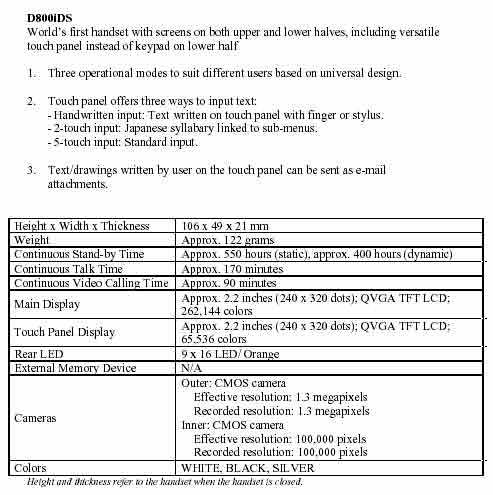 Text or drawings from the panel can be sent as e-mail attachments. The unit does have a full web browser but is not enabled with most of the other service / application options. Finally, the 10th handset on deck from todays announcement is an additional 903i-series handset coming from Sony Ericsson. The SO903itv is 1-Seg. 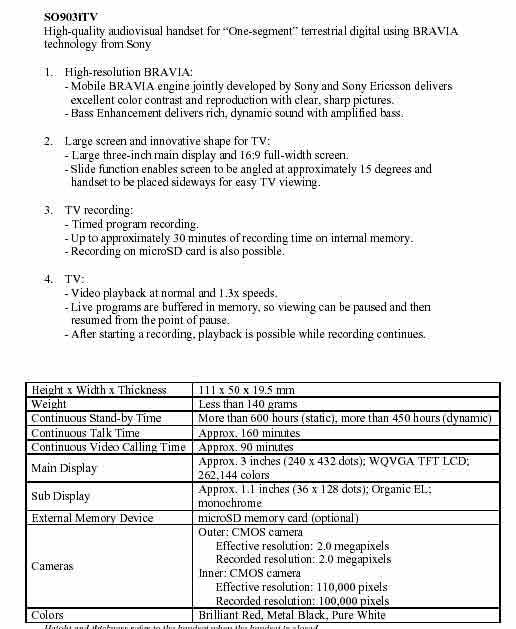 digital tv broadcast enabled with mobile BRAVIA’s high-resolution screen. The rotating three-inch main display does 16:9 viewing and allows recording for up to 30 minutes on it’s internal memory. Recording to removable microSD card is also possible. As live programs are buffered into memory users are able to pause or run video playback at 1.3x speed. Whew.. video of these models coming soon!